Grant Healthcare Foundation exists to support organizations dedicated to improving the health and well-being of the people of the Chicago area. We support healthcare services that have long-term positive effects on the health of the community. 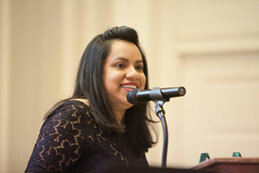 Our featured grantees and their programs are highlighted below. Grant Healthcare Foundation is excited to spotlight our support of the work of Dr. Daniel Johnson and his colleagues at the University of Chicago Medicine as they initiate Project ECHO (Extension for Community Healthcare Outcomes). This is an innovative model designed to increase access to best practice care for complex, chronic disease management in disadvantaged, underserved communities. 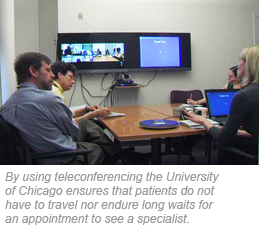 It uses regularly scheduled video teleconference sessions to connect University of Chicago subspecialists to primary care providers in federally qualified health centers on the south side of Chicago. The sessions function as "virtual rounds"; specialists share their medical expertise and provide training in state-of-the-art practices for chronic diseases, while community providers present challenging patient cases for discussion. ECHO sessions initially focused on resistant hypertension but now offer five additional programs with within their curriculum, including Child and Youth Epilepsy and Hepatitis C. ECHO training gives community providers the expertise and confidence to deliver state-of-the-art, evidence-based care to their patients in a local community setting. Patients do not have to travel outside their community to receive care and do not have to endure long waits for an appointment with a specialist. Project ECHO is growing rapidly, from an initial 6 community partners to a current list of 30 community health centers and community hospital outpatient clinics. This revolutionary model is transforming the way physicians practice medicine and care for the underserved. Project ECHO reduces barriers to specialty care and creates a network of community providers trained to address the most pressing health issues in the communities they serve. Under the Affordable Care Act (ACA), community health centers are taking a greater role in shaping the practices and policies that influence the health and well-being of our nation. In the Chicago area, the changes brought about by the ACA have a major impact on low-income and uninsured patients. To adapt to these changes, community health centers that would normally compete against one another have come together through the Chicago Safety Net Learning Collaborative to transform the way care is delivered to the most vulnerable patients in our region. Established in 2011, the Learning Collaborative brings together community health centers in order to improve health center operations and to address operational barriers in providing quality healthcare to low-income and uninsured patients. This is achieved with a framework of structured peer-to-peer collaborative learning sessions and evaluation of implemented tactics by members of the collaborative. Through this initiative, the health centers of the Learning Collaborative are focused on creating systems change within their organizations, improving patient-centered care, enhancing coordination between teams, and implementing new, and innovative approaches to health center operations.